I can't believe that we are already on day four of our blog hop. I hope you have enjoyed seeing our projects and we welcome your encouraging comments. If you are visiting all the blogs in order, then you should have just arrived from Heather Summers' blog. Heather is just the sweetest person and she totally amazes me with her creativity...as do all of this year's Artisans. It's back to cards for today's post. For this card I used a stamp that is traditionally viewed as leaves or something like a fern. I was thinking, "why does it have to only be leaves, couldn't it be a flower like gladiolias?" To color this image I stamped in Basic Black ink and colored it in sections with a Daffodil Delight marker. Before the ink had too long to dry I collected ink in the lids of my ink pads and used a blender pen to add some shading. You have to work fairly quickly and carefully so that you don't overwork the cardstock. Some of the flowers are stamped directly on the background and some are fussy cut and applied over top. It's difficult to tell in this picture, but some of the flowers actually look like they are coming off the page. RECIPE: Card Stock: Poppy Parade, Whisper White, Basic Black; Patterns DSP-Brights; Stamp Sets: Growing Green, Hello You; Blender Pen; Daffodil Delight Stampin’ Write Marker; Classic Pads: Basic Black, Pumpkin Pie, Poppy Parade; Mini Glue Dots; Designer Buttons-Brights; 1/2” Stitched-Poly Ribbon-Poppy Parade; Linen Thread, Big Shot Machine, Perfect Polka Dots Embossing Folder. Now it's time to hop on over to visit the talented Sandra Farrell. I wonder what amazing project she has for us today? If you get lost, here's a little guide to help you along the way. Tags: 2011 Artisan Award Blog Hop, Stampin' Up! Welcome to day three of the Artisan Award Blog Hop. I hope you are enjoying our projects as much as we are enjoying sharing them. If you are visiting all the blogs in order, then you should have just left the blog of the oh-so-talented Heather Summers. So far I have only shared cards, so I thought I would mix it up and share a scrapbook page with you today. This is the first scrapbook page I have ever done of my beautiful great niece, Gabby. Her older sister, Patty, is usually the subject of my pages, but my family was starting to hint that maybe it was time that Gabby got her moment in the limelight. There was a slight problem with that, however. Seems I just didn't have any good pictures of her. That's when my mom stepped in a shared some pictures she had taken. Thanks Mom! You may not be able to tell from this picture, but the blocks in the photo have a woodgrain pattern on them. I decided to carry that over to the circles on the page by using the woodgrain background stamp and Versamark ink to heat emboss a design on cardstock. I also used some Decor Elements vinyl to create a mask at the bottom of the page. By working quickly, I was able to sponge ink on the background and then carefully remove the vinyl without damaging the page. Recipe: Card Stock: Pacific Point, Melon Mambo, Pumpkin Pie, Pear Pizzaz, Whisper White; Woodgrain Background Stamp; VersaMark Pad, Clear Stampin’ Emboss Powder; Heat Tool; Big Shot Machine; Circles #2 Die; Dimensionals; 1 1/4" Striped Grosgrain Ribbon-Pumpkin Pie; Stamping Sponge, Pacific Point Classic Ink Pad; Heard From the Heart Stamp Set; Happiness Small Decor Elements (used as a mask). Now it's time to hop on over to visit Sandra Farrell to see what amazing project she has to share with you today. And if you get lost, here's a little guide to help you along the way. Welcome to day two of the Artisan Award Blog Hop. WOW, the first day of the blog hop went amazingly well. We even got to see two different never-before-seen cards that were somehow missing from the display boards at convention. This is the first stop on the tour, but if you get lost or if the links somehow get broken, you can always use the list at the end of this post. But whatever you do, make sure to visit everyone along the way. I am really enjoying seeing all the projects more closely and finding out all the little details. If you are visiting all the blogs in order, then you should have just left Heather Summers' blog. Her projects are so amazing...definitely a hard act to follow, but I will try! Now, for todays project I want to share another card. If I had to choose one card that shows the "real me" then this would be the one. I love classic elegance and that is what I was going for when I designed this card. This card is a big jump from the clean and simple card I showed yesterday. And before anyone asks...yes, I hand-placed every last one of those pearls without a pattern. I love the rose from Fifth Avenue Floral, but I have always felt like it needed to include a leaf stamp. I think the leaves from the Autumn Splendor look just like a rose bush, but then, I do have a vivid imagination and the only time I have a green thumb is when I get ink on it. I stamped directly on the DSP and colored the leaves with Stampin' Write Markers. The rose took even more time because I stamped it three times and cut them all out and then layered them with dimensionals. For even more interest, I added some shadowing with a Versamarker. Lot's of attention to detail...but worth every bit of it. Recipe: Card Stock: Basic Black, Whisper White, Daffodil Delight; Elegant Soiree DSP; Stamp Sets: Fifth Avenue Floral, Autumn Splendor, Afterthoughts; Classic Ink Pads: Basic Black, Always Artichoke, Garden Green; Craft Pad: Basic Black; Clear Embossing Powder, Heat Tool; Embossing Buddy; VersaMarker; VersaMark Pad, Blender Pen; Basic Pearls. Now hop on over to visit Sandra Farrell to see what amazing project she has to share with you today. And if you get lost, here's a little guide to help you along the way. Welcome to the 2011 Artisan Award-winning projects Blog Hop! We are so excited to share our projects with you! It still takes my breath away to know that I was chosen as one of this year's Artisan Award winners. I feel so blessed to have my projects picked along with so many talented ladies. 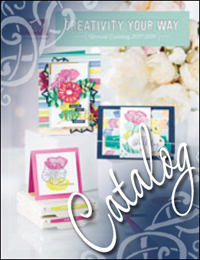 Hundreds of talented Stampin' Up! demonstrators in the United States and Canada submit their entries each year, but only ten are chosen as Artisan Award Winners. Entries must consist of five cards, three scrapbook pages (8" x 8", 8-1/2" x 11", or 12" x 12", single-layouts only), and two three-dimensional projects. The projects are judged as a whole (not as individual projects), so while some entrants may be very talented in one area, Artisan Award Winners must demonstrate proficiency in a wide variety of categories. Entries are judged on creativity and style, craftsmanship, composition, color, and consistency. Please remember that art is very subjective. Just because something isn't "your style" doesn't mean it isn't worthy of winning the Artisan Award. Each of these talented ladies worked very hard to make their projects stand out above all the others and deserve your respect. Please keep your comments positive and upbeat! Every day for the next ten days we will be posting a new project. I hope you have fun checking out our projects. I had the opportunity to see the projects in real life at convention, but now I get to find out how they were made and maybe hear some interesting stories along the way. Our blog hop of ten Artisan Award winners makes a complete circle. It doesn't matter where you start or start, just be sure that each day you visit all ten blogs to be inspired by these incredibly talented ladies. I am first on the list, but since we are making a circle, you may have arrived her from Heather Summer's blog, Stamp with Heather. Many consider Heather to be the Queen of Stampin' Up! She was the number one demonstrator in Canada this past year, has a fabulous blog, and is a familiar face on the My Digital Studio blog. On top of all that, she is incredibly talented and a genuinely sweet person. I am so glad I can call her my friend. For my first project I would like to share a fun card. Using clear mount stamps made this card a cinch to create, but I masked off the top of each flower just in case I didnt' hit the mark. Craft (Crumb Cake) card stock is really popular right now as a neutral color. You see it in all the card magazines. I wanted to capitalize on the trend so I made sure to utilize it on some of my projects. I stamped the leaves in Old Olive and ink and carefully used a blender pen to color the leaves. A simple sentiment and some sponging give this clean and simple card just enough pizazz to keep it from being too simple. Linen Thread; Mini Glue Dots; Ice Cream Parlor Button Pack. That's my project for today, now hop on over to see Sandra Farrell's amazing project at Stamper on the Shore. If you get lost along the way or if some of the links get broken, you can refer to this list for a direct link to each blog. Have fun and happy hopping and be sure to check back for the next nine days for more award winning projects.